So, I installed the knife hinges. I was really stuck on that for some reason — and I’m still a little nervous waiting to see how they will work out once the cabinet is fully assembled. But enough about that. 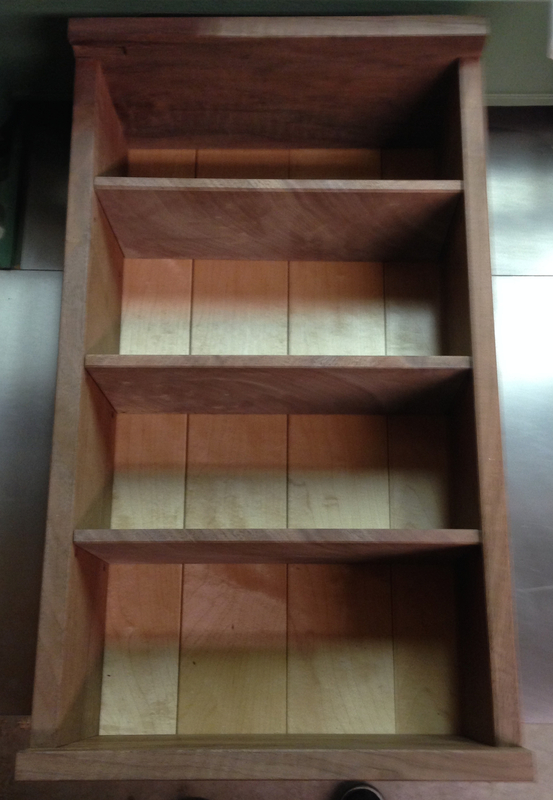 I fit the maple ship-lapped back boards to the cabinet, and applied a few coats of blond shellac, rubbed out with wax. I cut shelves to fit and checked everything for fit. The other thing I did was to make a wooden pull for the door. Actually I made two. One in Macasser Ebony, but it split when I was assembling it (@&#!! 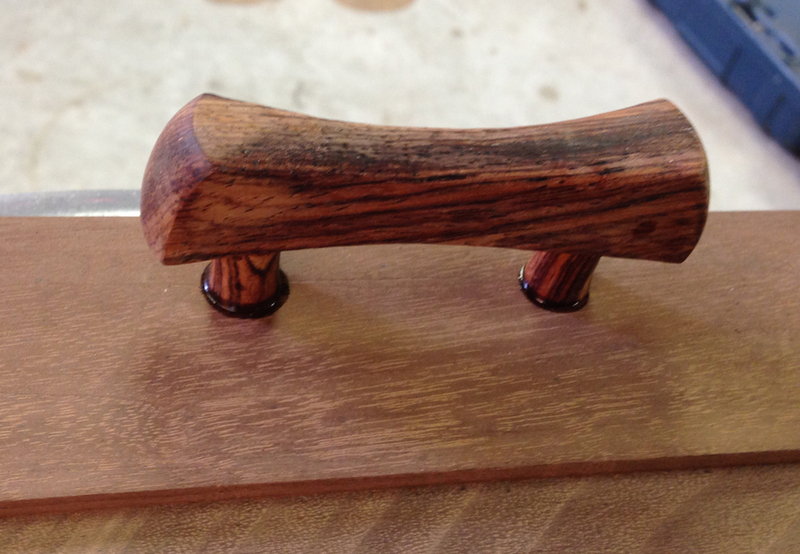 ), I made another in Cocobolo as I didn’t have any more of the Ebony. I picked up some pen blanks to make the handle, which is a great way to buy little pieces of nice wood. 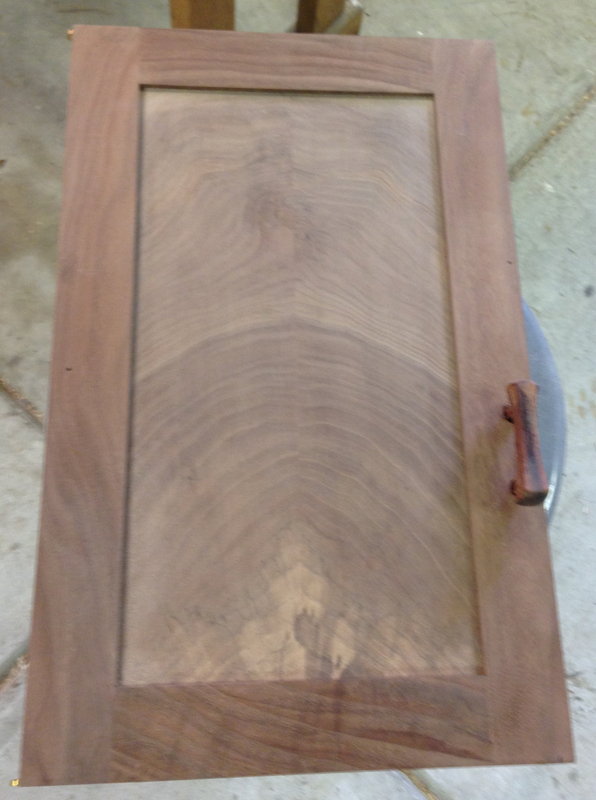 I turned two 3/8″ posts with 1/4″ round tenons on both ends, and drilled the door and the back of the handle to fit. I glued it together with epoxy. 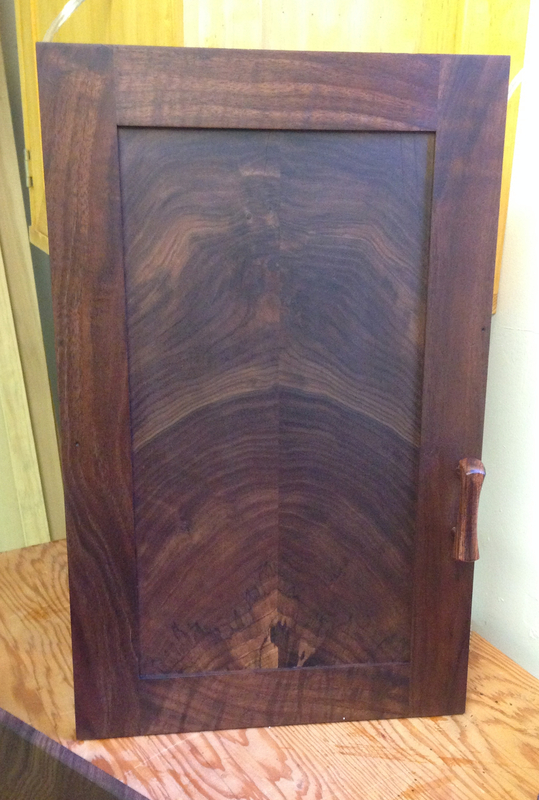 Finally, after sanding the outside of the cabinet I slathered on a coat of Tried & True Oil/Wax finish. I’ll leave this to dry for a few days, then install the back, mortise in the keyhole hangers on the back (I wonder if I can do that before I install the back slats?) 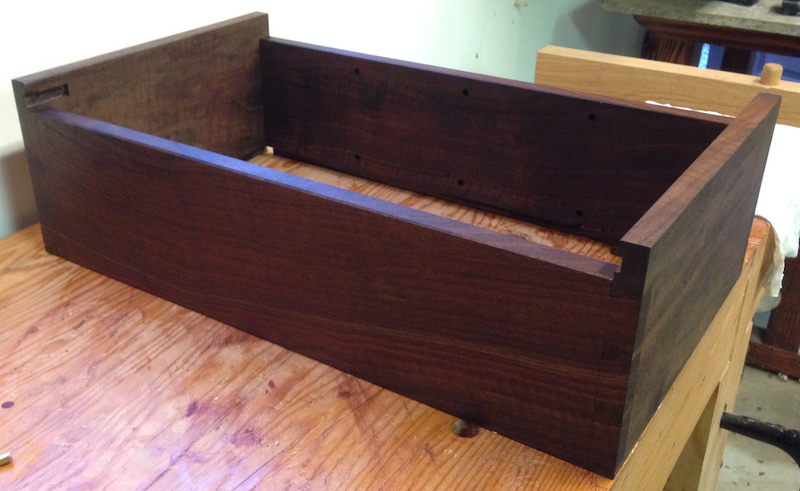 and apply another coat of finish. It’s pretty dark, but I like the color of the walnut. Wow, love the book-matched panel! I like the handle shape. Did you color the epoxy black? The ring of it at the bottom of the post looks good too. Thanks Ralph. I didn’t tint the epoxy, but the way the walnut gets so dark with the finish applied makes it look like I did. The posts that I turned have a slight concave profile, as the epoxy cures I’m hoping that makes a slight transition fillet into the face of the door. The handle was fun to shape, I used a scraper to refine and smooth the shape. If I had it to do over I’d make it about 1/3 smaller. It’s not too big, but I think smaller would have been better.